As I've mentioned earlier there are a range of preparations using peppers. The most simplest one as Jilal pointed out is simply peppers with salt and pepper, vinegar and olive oil. I also want to mention that I will post about specific regional specialties. Don't worry Staifis I remember the cuisine of our Wilaya. I have the recipes, but the photos are taken in real time according to what I eat or prepare for family and friends. I made this as a gift for a family member who likes garlic and hot peppers. 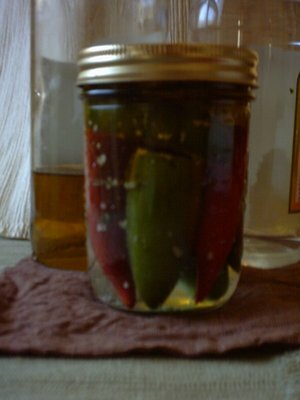 If you do not like garlic and hot peppers us a milder chili and omit the garlic. It will still be authentic if that is of concern and yes, it will still be delicious. Algerian lemonade and orangeade are the precursor to French Orangina. The cherbat or syrup base is an Arab influence which also traveled to other Mediterranean countries that commercialized the product with brands like Monin. 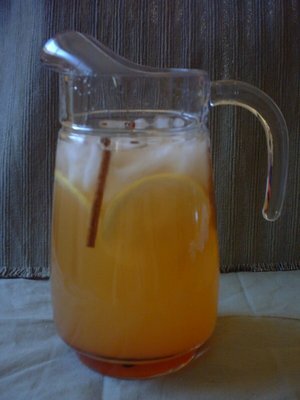 1 lemon for garnish and to add fresh lemon juice when the lemonade is mixed. Optional garnishes and flavorings include: cinnamon sticks, edible rose petals, rosewater and cloves. There are a wide range of felfel preparations in Algeria. 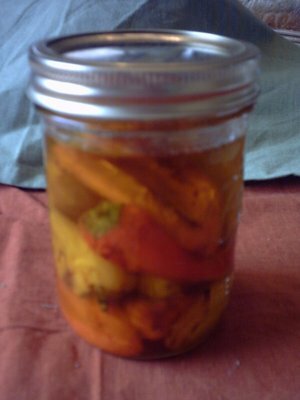 This one is a sweet pepper confit served as a kemia or meze and also as side dish or garnish. It is very rich and flavorful.